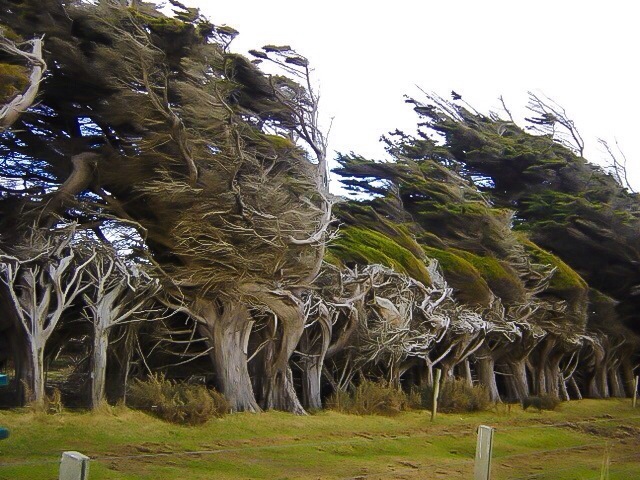 the force of the winds on the coast at Orepuki, New Zealand cause the trees to bend. the force is great but the trees do not break under it. when faced with difficulties, we presume that it’s a positive to be hard, but i believe it’s much more important to be unbreakable. i would argue that being able to bend or flex under pressure without breaking is a more important attribute than hardness. [a person] who bends without breaking and bounces back up will prevail over the hard [person] – someone who is resistant to bending under pressure but will break with enough force. my submission for this week in the the wordpress weekly photo challenge. i hope you enjoy. to view my other submissions click here and here. What an unusual image, have never seen anything like it, great entry for the zig zag challenge.